At what age was Cesc when he become an Arse 1st team regular? But like Wilkins or Rooney, I don't think there is any question of him succeeding because the club gave him game time. He was simply good enough, an upgrade on whoever was playing before. Arsenal losing, and spurs and united playing each other tomorrow. Absolutely must take advantage with 3 points today. Absolutely. Also playing a team today that is struggling with an awful negative atmosphere (I live in Newcastle). There is absolutely no excuse whatsoever for us not winning this game. Still, I'm worried this will be another game in which we pass it around the box, hit the post, and draw 0-0. Hey! That's an interesting idea! I guess a bench spot is all he can hope for, but not even sure he’ll get that with all of our wingers back fit, plus Morata. 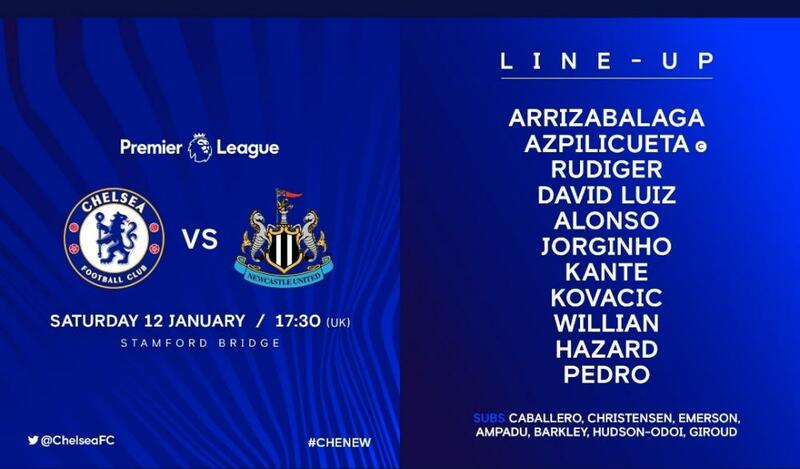 Depends if we go false 9, in which case there will probably be just one striker kn the bench plus CHO. Suspect Sarri genuinely sees him as more useful than having either of them kn the bench, at least I hope he does! Salah given ANOTHER penalty today that we aren't getting in a million years. The slightest touch on his calf sends him into an impromptu overhead kick off a fall. Morata would've been yellow carded. False 9 again with Alonso and Azpi as full backs... I guess Sarri is happy with what he is seeing. Rafa would have done his homework against us. 1st half goal is crucial in this or else it could be a frustrating 90. Boring line-up (and the wrong one imo). Giroud must be some way off playing 75 mins. Otherwise Sarri is mad. Newcastle playing a 541 and with the fat one managing you can be sure they’ll be compact.